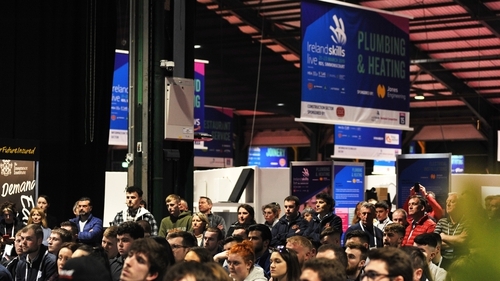 123 finalists are competing in the inaugural Irish National Skills Live finals at the RDS over the next three days. The competitors are spread across 25 different categories, ranging from carpentry to beauty treatments and aircraft maintenance to restaurant service. As wells as the traditional trades, there are also trainees competing for top prize in a range of high-tech sectors, including cloud computing and Building Information Modelling. Each competitor will undergo an 18 hour skills test as part of the competition, overseen by judges and examiners from educational institutions and industry. The winners will go on to represent Ireland at the World Skills competition in Russia in August. While individual sectors had their own national finals in the past, this is the first time that all 25 have come under one roof to compete. Minister Mary Mitchell-O'Connor will present the prizes to the winner at a ceremony in the RDS on Saturday evening. Thousands of second level students are also attending the event over the coming days. The three day expo aims to promote college courses, apprenticeships and traineeships that offer skills and on-the-job learning. It also aims to help to address the serious skills shortage identified in Ireland and help inform students, their parents, teachers and careers advisers about the exciting career paths available through such courses. Industry leaders attending the event to talk about career opportunities include SISK, The Designer Group, CIF, Grafton Group, Lufthansa, ESB, Failte Ireland, Sodexo, Irish Aviation Authority, Jones Engineering, Bus Eireann, SIMI, the Insurance Institute and Dublin Aerospace. The HEA, GMIT, ETBs, TU Dublin and Solas also have strong presences at Ireland Skills Live to explain the 'Learn and earn' options to students. The event is holding a family day on Saturday and entrance is free.